When it comes to special items of clothing, like a wedding dress, an expensive suit or a silk nightie, you don’t want to hang them on any old wooden or wire hangers, do you? 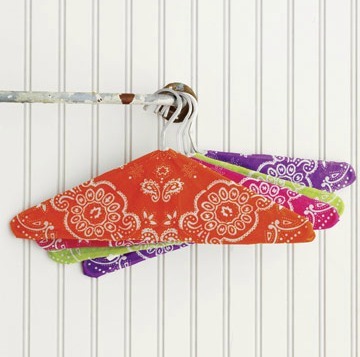 Give these special clothes the preferential treatment by hanging them on these spruced-up, fancy hangers! Not only are these great for delicate pieces, they also add pizazz to a boring closet, work as photo props for weddings and make wonderful holiday, bridesmaid and shower gifts. 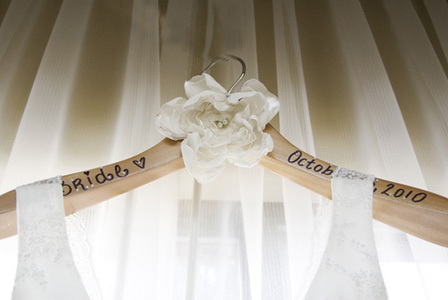 A pretty hanger can make all the difference in wedding dress photos, as well as make an incredibly thoughtful gift. Give your fancy clothes the support they deserve, or give your friends and family a gift they won’t forget, with these adorable DIY hanger projects. Not only are wire hangers unsightly, they don’t work very well for keeping your clothes looking their best. Spruce up your drab wire hangers and keep your clothes in place while they hang, with this fun DIY tutorial by Kimmy and Ash of the Green Eyed Monsters. Made from just two materials — wire hangers and old T-shirts cut into thin pieces of yarn — this project is easy and extremely budget-friendly. For the complete tutorial, check out this post by the Green Eyed Monsters. If you want something more plush, like these ones for sale on Etsy by Linda Honneffer, you’ll need to gather a few more materials, like plush batting, fabric, a ruler, staple gun and staple, and ribbon. Although these thick, luxurious hangers are harder to make and require more time and materials, the result is worth the time and effort. These adorable ribbon and fabric hangers look just like ones that retail for more than $30. Plus, you can customize them with different fabrics and colored ribbon. For the complete tutorial on how to make these, check out Martha Stewart! To make them, simply write the person’s name or article of clothing with the Sharpie and add pretty embellishments using the glue — simple as that! To make the beautiful flowers in the middle, check out this step-by-step tutorial by Alicia of A Charity Wedding. This is another pretty way you can not only make your hangers more festive, but make them work better at hanging your delicate clothes. These hangers can be made with any kind of fabric you have lying around, so these could cost nothing out of pocket for you! 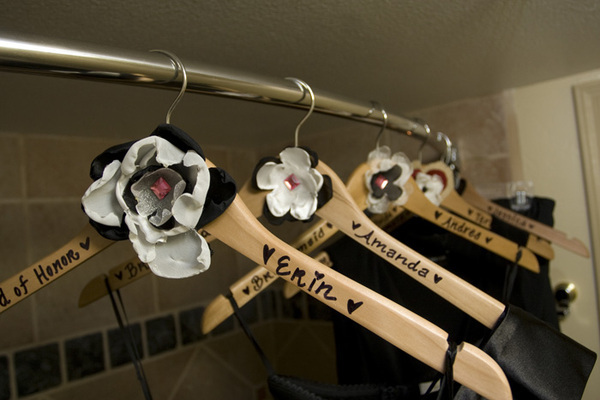 Create custom hangers for your closet to keep your strappy items in place or give these out as wedding gifts or favors. For truly one-of-a-kind fabric hangers, create your own fabric by stitching multi-colored hankies together and sewing those around old wire hangers. For the complete tutorial on these fabric bandana hangers, check out Country Living or this tutorial with a bow by Design Sponge. Who knew hangers could be as cute as the clothes they hang?